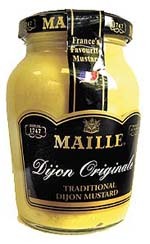 For many people, the name “Dijon” only means delicious, spicy mustard. 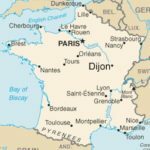 But maybe you didn’t know that the city of Dijon is the capital of the region of Bourgogne…in English, Burgundy. Now you’re getting thirsty because it isn’t just mustard you are thinking about! Burgundy is a region in east central France, southeast of Paris. We think of wine, but historically this area was the home of wealthy nobles more powerful than the king of France. 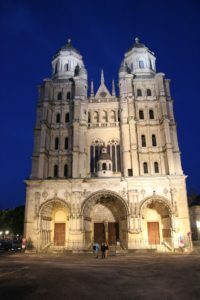 In the 15th century this region was “adopted” and became a part of France following the death of Charles the Bold during the 100 Years War. 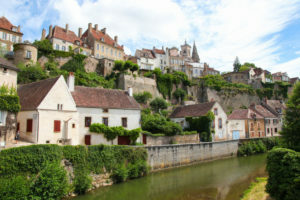 Some of the well-known towns are Dijon, Beaune, and Sens. 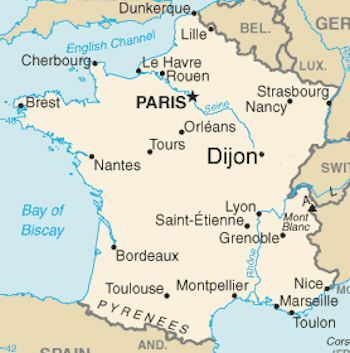 Dijon is the capital if the region. Burgundy is one of France’s most important wine-producing areas, and very popular for wine enthusiasts and tourism. But there’s more than wine to lure you there. Medieval villages and abbeys, historic cathedrals, and an old-world beauty surrounded by lush vineyards and hillsides all welcome you. The names of Cluny and Vézelay have a place in medieval history, and are found here in Burgundy. 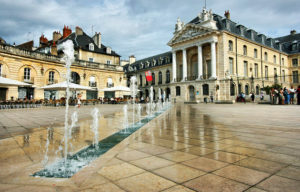 Dijon is a must-see stop during your Burgundy visit. It was once the city of the Dukes of Burgundy in the 15th century, and the architecture bears witness to their power and wealth. It’s only about a 90 minute train ride from Paris. Enjoy the city by way of a free hop on/off bus that will take you from place to place. Many of the impressive mansions of the past have been transformed into elegant hotels. Today Dijon is a sprawling and affluent city of culture and history. The Palace of the Dukes: Reconstructed at least twice, this impressive 14th century building is now home to the Musée des Beaux Arts, one of the oldest art museums in France. The building features gothic and French baroque architecture. Open Market, Les Halles: This is the primary covered market in the city, whose architect, Gustave Eiffel, also designed the Eiffel Tower. It’s called one of the best open markets in the world. You’ll want to drop in to experience the energy and beauty, and buy a few picnic items. Market days are Tuesday, Thursday, Friday, and Saturday. Annual International Gastronomic Fair is held in November. Tour Philippe le Bon: A tall tower (316 steps) affording you a view of the town and surrounding countryside. It was built in the mid-15th century. Notre Dame: The Dijon Notre Dame cathedral dates from the 13th century. The wooden Virgin Mary statue inside is one of the oldest in France. On top sits a 14th century mechanical clock that chimes every quarter hour. 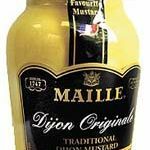 About mustard: The Maille mustard shop has hundreds of mustards (and a tasting bar!) See below for more information on mustard tours. Place François Rude: an appealing square where you’ll find cafés, lively atmosphere, and a carousel. Museum of Burgundian Life in Dijon: A free museum on Rue St. Anne, off the beaten path, located in an 18th century monastery. It recreates shops from the 19th and 20th centuries, as well as other practical aspects of past Dijon life. Three floors include life-size models dressed as they were then. Jardin botanique de l’Arquebus: a 19th century botanical garden, where you’ll see a cypress tree over a century old, and a natural history museum. Entrance is free. Musée Magnin: 4 rue des Bons Enfants. A national art museum with over 2000 works, opened in 1938. Kir Lake: Just on the edge of the city of Dijon is a lovely lake where you can do water sports, picnic, or go to its beach. Jardin Darcy: Another beautiful natural spot to recharge on green space. Located at Place Darcy, this park is open from 7:30 am to 7 pm. It’s in the heart of Dijon, so a good place to stop off and relax after visits and shopping. Church of Notre Dame of Dijon: 13th century cathedral, gothic architecture. Musée archéologique de Dijon: 5 rue Dr. Maret. Founded in 1832, this museum includes artifacts from pre-history up through the middle ages, including sacred art and architecture on 3 floors. For a mustard factory tour you can head to nearby Beaune for La Moutardarie Fallot. http://www.fallot.com/en/ , a family-owned company since 1840. So, along with your mustard and wine, come taste the fun and beauty of Dijon! Bourgogne, Burgundy, France, mustard. Bookmark.